From our work in the trenches, to our amazement at the heavens, it’s been an awe-inspiring summer at One22. Our leadership is growing, with the addition of Margot Snowdon to our Board of Directors, and the formal promotion of Carey Stanley to Program Director. After more than a decade of work in social service in Jackson, I continue to marvel at the courage shown by our neighbors in need who reach out for help. While data doesn’t tell the whole story, it does show a degree of magnitude to the number of people served in One22’s Emergency Service, Language Access, and Latino Support programs. Take a look at One22’s July service data and join me in awe and pride. In this month’s Spotlight, we’re pleased to provide insight into the interpretation portion of One22’s Language Access program. We’re working hard to maintain the soul of the former El Puente as we move forward as a unified One22 - when you understand the deeply held values of the interpretation field, I think you’ll see why. None of this would be possible without the dedication and skill of One22’s committed staff, or the generosity of good people like you who support us. This year’s Strength of One ad campaign aims to bring together our staff, our services, and our need for you. Every single person makes a difference, and so does every dollar. Please remember One22 in your Old Bill’s Fun Run giving - thanks to the Community Foundation of Jackson Hole, you’ll find us listed under One22, and under each of the legacy organizations. Looking forward to fall, we are pleased to present The Community Interpreter ®, in partnership with the Wyoming Department of Health Office of Health Equity. Visit our website for more information about this opportunity to raise up the profession of interpretation in our community. We wish you a happy and safe Labor Day Weekend, and we look forward to seeing you at Old Bill’s Fun Run on Saturday, September 9th. We’ll be celebrating the many faces of our community with face painting for the kiddos - come see us! PS - If you or someone you know is raising funds to support a specific person or family in crisis, we can help provide additional exposure for your GoFundMe or other crowdfunding platform. Check out a new page on our website: Neighbors In Need. Margot grew up on the East coast, graduated from the University of Pennsylvania, and has an M.S. in Education from the University of Wisconsin, Madison. She moved to Jackson from Boston in 1979, intending to spend a year learning to ski, and never left. She taught yoga for 25 years, opening the first studio in the state of Wyoming. Since retiring from teaching, she has dedicated herself to supporting philanthropy in Jackson Hole, with a particular passion for social issues. She is an Emeritus board member of the Jackson Hole Community Housing Trust and Teton Science Schools. She currently serves on the Community Foundation Board, and is learning the ropes as a new board member at One22. With El Puente since November 2015, Carey Stanley now works as One22’s Program Director. Carey holds a MA in Latin American Studies and an MA in Cultural Anthropology, with her research focused on the globalization of health and family planning, HIV/AIDS, and women’s health in Honduras. Carey brings a strong appreciation for cultural competency to the organization, having lived and worked abroad in more than seven countries. In her past life, Carey has worked in both applied and academic fields: conducting research, program evaluations, feasibility studies and program support in the family planning and global health fields; and teaching courses in Anthropology, Spanish and Women’s Studies. When not at One22, Carey can be found playing in the mountains with her husband and three children. All three predecessor organizations, Community Resource Center, Latino Resource Center, and El Puente provided client assistance with a variety of specialties. Today at One22 a unified Client Advocate team coordinates services for better outcomes. Across the board our goal is to help manage and/or prevent crisis through proactive planning and personal consultation and advocacy. Here is a look at services provided in July 2017. 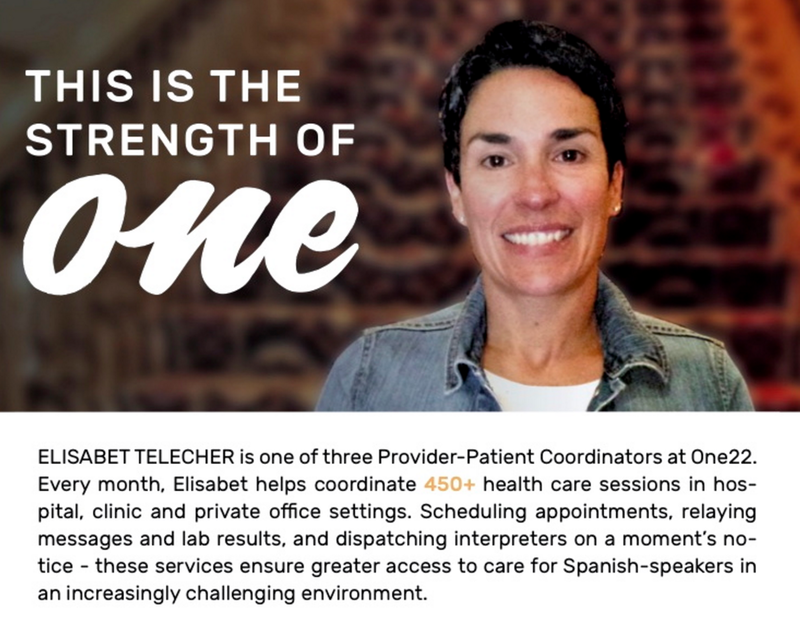 Following the legacy of the former El Puente, One22 provides verbal interpretation services so that limited English-speaking members of our community can communicate effectively with healthcare providers in private practice, clinic, and hospital settings. Here is a look at July 2017 in Interpretation. Next month, we'll spotlight an important service many aren't aware of - the Provider-Patient Coordination of appointments, results, and more. Many people know we provide interpretation services, but are often surprised by what that really means. 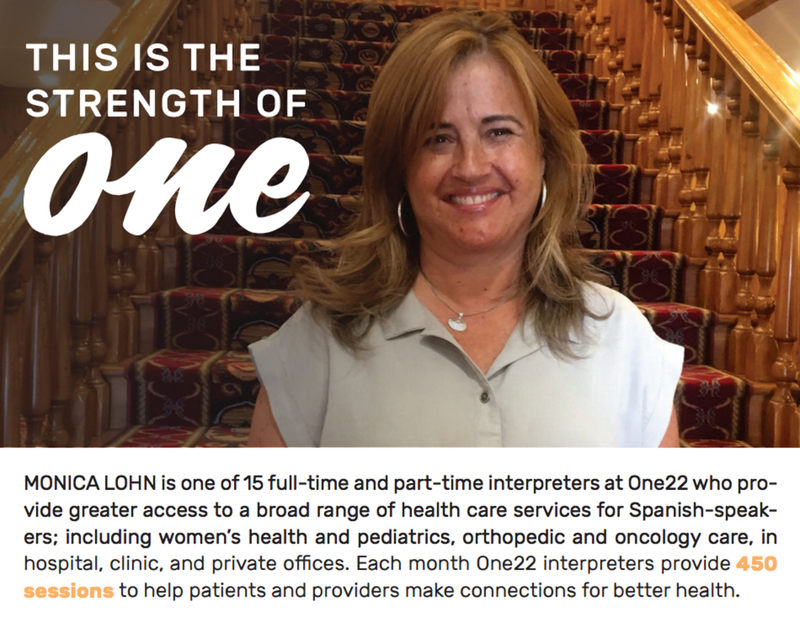 One22 interpreters provide greater access to a broad range of health care services for Spanish-speakers; including women’s health and pediatrics, orthopedic and oncology care, in hospital, clinic, and private offices. 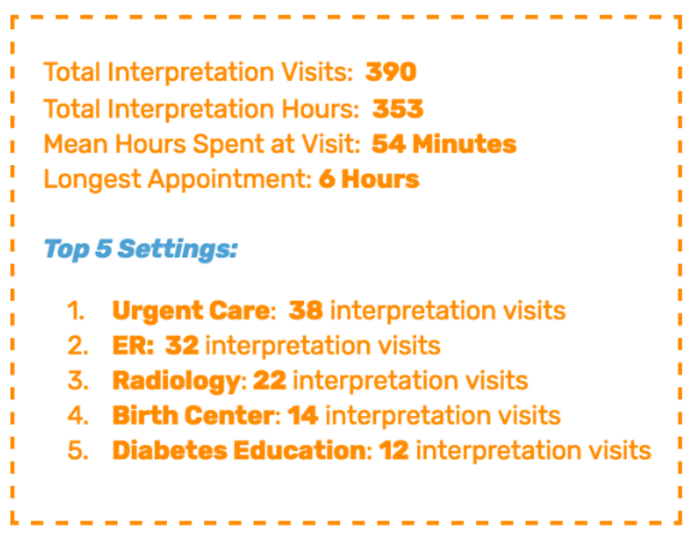 In July One22 interpreters provided 390 sessions to help patients and providers make connections for better health. One22 interpreters not only provide on-site interpretation services for Spanish-speaking members of our community, but they establish long-term relationships with clients and provide extensive support, information and referrals for people with serious illnesses, frightening injuries, or who face cultural barriers to receiving preventative care. Through the unified programs of One22, they make efficient referrals to address other needs too, such as immigration or financial empowerment assistance. Our goal is to ensure that no member of our community is denied access to medical care or human services due to a language barrier. Our Strength of One ad campaign is running in the Jackson Hole Daily every Tuesday, Thursday and Saturday and the JH News&Guide every Wednesday through September. Our campaign focuses attention on the magnitude of our critical services, and the strength of One22’s staff. Below are the ads from the past six weeks of our campaign. We believe that our community is stronger as one. As often as we are asked for help, we are also contacted by those who want to help others in a time of need. Our new website seeks to link the two with a "Neighbors in Need" page devoted to community members in need of support. If you have a link to a GoFundMe or Meal Train page, or are seeking community support in general, we invite you to put a listing on our site. Message us on Facebook or email info@one22jh.org for more information. Click HERE to visit our"Neighbors in Need" page. Please remember One22 during Old Bill's giving period of August 1st through September 15th, 2017! Click HERE to make a donation through Old Bill's Fun Run.